and aerospace with various business leaders and interested citizens. During the midmorning hours at the Arvest Bank Friday Forum, Lt. Governor Matt Pinnell made opening remarks about his vision to enhance the state’s economy while Bird concluded the meeting with his presentation regarding the history of aviation and aerospace across the state. Bird cited the importance of Frank Phillips in the state’s aviation history through his support of Wiley Post. 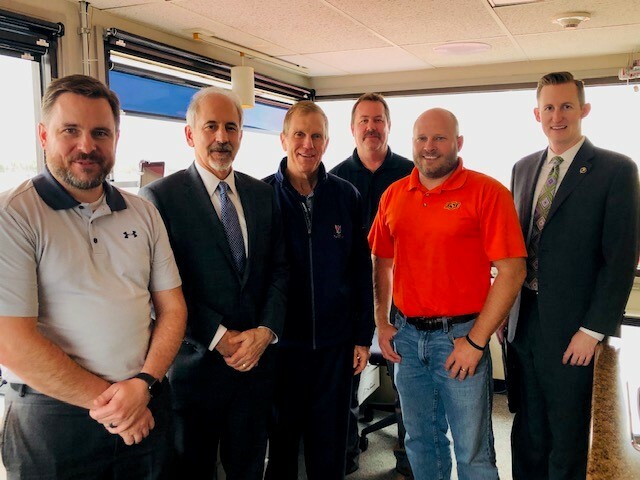 That afternoon, Aeronautics Commissioner Kevin Potter hosted a meeting with the Bartlesville Municipal Airport, Commission staff, and city officials to discuss the future needs of the airport. The airport has an annual economic impact of $15M and has an annual spending of $9.7M. “We were so honored to be invited to come and spend the day in this community. Some might say that Bartlesville is the birth place of commercial aviation due to flights being made to oil well sights by plane, and I’d say that is a pretty good legacy to claim. It is a beautiful town and they should be proud of their citizenry and accomplishments,” said Bird.